Alcohols and terpenes derived from cedar are food additives listed by the US Food and Drug Administration (FDA) as Generally Recognized as Safe (GRAS). These food additives are used as flavor enhancers, flavoring agents, or adjuvants. Cedarwood oil is often used in homeopathic remedies, vaporizing ointment, and topical products. Is cedar oil safe in the workplace? No standards or guidelines have been set by the Occupational Safety and Health Administration (OSHA) for cedar oil. OSHA has not spoken about occupational exposure or workplace allowable levels of cedar oil. Cedarwood oil is not listed on the American Conference of Governmental Industrial Hygienists (ACGIH) list of compounds recommended for a Threshold Limit Value (TLV) or Biological Exposure Index (BEI). In layman’s terms, this means the ACGIH doesn’t find cedar oil dangerous. If cedar oil were considered unsafe it would have associated regulations, standards, guidelines, and exposure limits by one or multiple federal authorities. Currently, it has none. Is cedar oil safe for the environment? Cedar oil is also not listed as a hazardous substance, priority pollutant, or toxic pollutant under the Clean Water Act. Cedarwood oil was initially registered in 1960 as a pesticide to repel moths from clothing. Because of this, cedar oil was subject to the requirements for reregistration eligibility broadcast by the EPA in 1988. The EPA issued its Reregistration Eligibility Decision (RED) document for cedarwood oil in 1993. Based on information collected as the result of RED, the EPA deregulated cedarwood oil in 1996 and no longer requires manufacturers of cedar oil products to register the oil as a pesticide. This is why Wondercide products carry the FIFRA 25b Exempt From Registration status. Cedar oil is the active ingredient in Wondercide products but is not considered harmful to people, pets, or the environment; so, we don’t have to register our products with the EPA. Is cedar oil safe for pets? 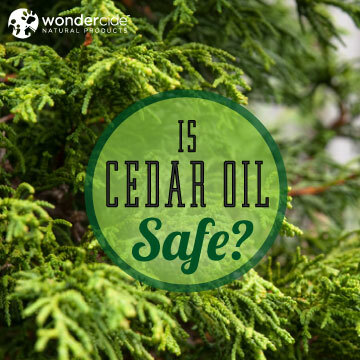 YES, cedar oil is safe for pets and people, including cats, newborns, and nursing moms. Many people ask, “Is cedar oil safe for cats?” We understand the confusion about this topic. There is a lot of contradictory information on the internet about cedar oil. 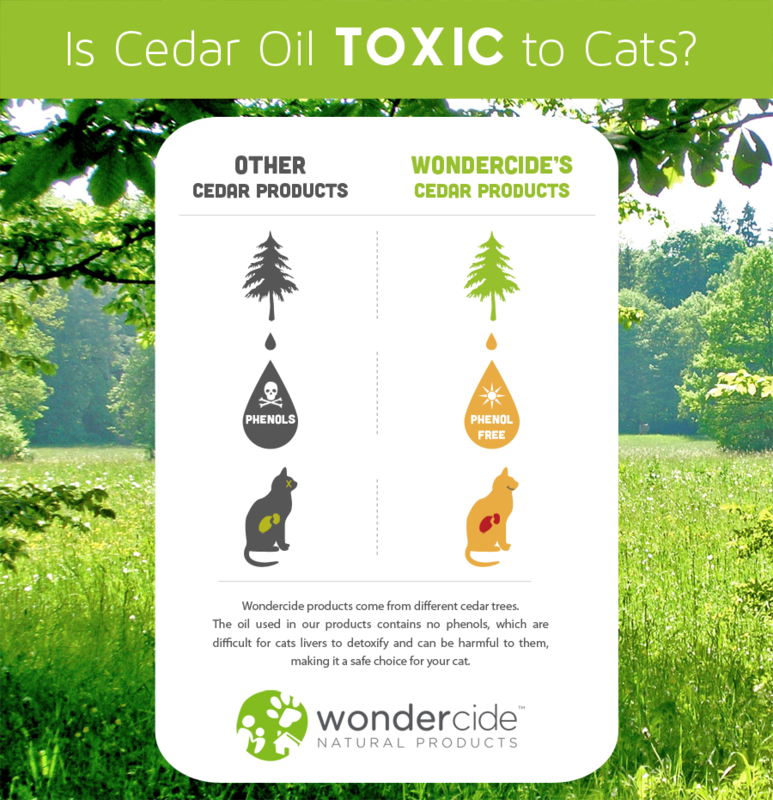 While cats are more sensitive (to everything) by nature, you can safely and effectively use Wondercide cedar oil as a natural flea and tick control on cats. Learn How to Use Flea & Tick Pets + Home on Cats Click here for step-by-step instructions. 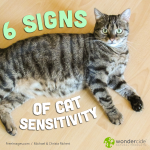 Learn the 6 Signs of Cat Sensitivity Click here to learn. I sprayed some on the floor and my puppy licked it. Is it toxic when ingested? Thanks for your question! The ingredients in Flea & Tick Pets + Home are human-food-grade, so you shouldn’t need to worry about the puppy licking some off the floor. The puppy may have a bit of a tummy ache from eating oil, but it is not toxic to ingest some. Hope that helps!? Hi! I was going to treat my yard with concentrated cedar oil for ticks, but will it harm the tree frogs and bullfrogs in my neighborhood? Thank you so much for your help! Hi, Tam! Thank you for your question. Treating your yard with Wondercide outdoor concentrate will not harm the tree frogs and bullfrogs in your neighborhood. For ticks, we recommend treating the yard twice 7-10 days apart to get rid of the problem and then about once per month for ongoing prevention. We hope this helps, but let us know if we can help with anything else. Regards! What about the butterfly eggs on my milkweed? Will it kill the eggs? Thank you for reaching out. Our Flea & Tick Control for Yard + Garden and Outdoor Pest Control kill non-beneficial insects by blocking their octopamine receptors, which causes bad bugs to suffocate. These natural yard products are safe around adult beneficial insects like butterflies and bees, which do not have octopamine receptors, but saturating the butterfly eggs on the milkweed plant may still kill them. If you are trying to preserve the butterfly eggs, we would recommend not saturating the milkweed plant when treating the yard. We hope this helps, but feel free to reach out with any additional questions. Cheers to you! I just sprayed the outdoor pest control and wanted to know how long I should wait before letting my dogs outside? What if they drink from a puddle created from my spraying? Our Outdoor Pest Control products are safe for you and your dogs to be around immediately after treatment- there’s no wait time! Because this product (and all of the products that we make) are made from human food-grade ingredients, they are safe even if some is ingested. So no worries if your dogs lick some up from a puddle! We hope this helps, but please let us know if you have any additional questions! Is cedar oil safe for humans to breathe in? I live in a small trailer and I spray all over . It,s just about too strong for me. Will it harm me to breathe it for a long time? Also will it kill a large roach if I spray on it? Thanks for your question, Sharon. ​Yes, the cedar oil used in Wondercide products is a safe, human food-grade ingredient and will not harm you if inhaled (even over extended periods of time). Cedar oil affects octopamine, which is essential to life for pheromone-driven pests (like roaches) as it is responsible for regulating heart rate, movement and behavior in insect pests. When contacted directly with cedar oil, the insect’s octopamine receptors are blocked, causing roaches and other pests to perish. Mammals (like us! ), birds, fish, amphibians and beneficial insects are not affected by cedar oil because they do not have octopamine neurotransmitters! Do you ship to Canada.? Thank you so much for reaching out and for your interest in Wondercide! Due to Canadian regulations, we are not able to ship our products into the country at this time. That said, we hope to be able to offer these great products to Canadian customers sometime soon, and we would be happy to contact you as soon as we are able to do so. We will alert our customers when we are shipping to new regions via our newsletter, which you can sign up for on the bottom of the page at Wondercide.com! I hope this helps, but please let us know if you have any additional questions! Thanks again for your message. I think my daughter has whooping cough and has a lot of phelm/mucas. I was reading take a small amount a day really helps. Where should can I purchase a food grade? Thanks for your comment, Tosha. We applaud you for looking for natural solutions to help with your daughter’s whooping cough! We’ve heard of this remedy before, but would always recommend you reach out to your daughter’s doctor for recommendations on what will be best for her condition. While we only use the highest-quality, human food-grade ingredients in our products, we do not sell the straight oils. We wish you the best of luck in locating these solutions for your daughter, and welcome you to reach out if there is ever anything we can help you with in the future! Would using cedar oil in a vaporizer help rid our home of fleas? Thanks for your message, Becky. While using EOs in a vaporize can be great for aromatherapy, we can’t guarantee that it will be effective at killing or repelling insect pests like fleas from your home. If you’re looking for a safe, natural product to rid your home of fleas, our Flea & Tick for Pets+Home spray would be a great fit, and can help you get those bad bugs under control. Please let us know if there is anything further we can do to help you! Hi! Will this product effect spiders as well being ticks are in the arachnid family? Yes, our products are designed to kill and control insect and arachnid pests, including both spiders and ticks. Sorry should have asked this in the above, do you happen to know if your product will effect types beneficial nematodes? I ordered your cedar oil spray for my dog and I find no suggestions for either how or how much to apply for a small dog. This would seem to me to be a required bit of information. To use, rub your pet’s coat in the opposite direction of growth, spray, and rub in. Spray the body, legs, tail, belly and armpits. Spritz into your hands to rub onto your pet’s ears and face. The exact number of sprays will depend on the size of your dog. Avoid spraying in mouth, nose and eyes. Do not soak your pet. Full coverage will ensure best results. Apply every 2 – 3 days for pest prevention or as needed to kill and repel fleas, ticks and mosquitoes. The pest pressure is different by geography, so you might find you use it more or less frequently. It’s safe for everyday use. Hi yes, we sprayed our dogs with Wondercide cedar tick and flea treatment, our one dog immediately started to lick himself and then started to foam at the mouth. I was wondering if this was okay and will not harm him or if we need to go to the vet ASAP. Because our products are made from 100% naturally-derived, food-grade ingredients, they are non-toxic and its ok if some product consumed or licked off. As with most things, overconsumption may lead to an upset stomach but is otherwise fine if some of the spray is licked after spraying. Dogs and cats will drool or foam to get something out of their mouths that they find distasteful and is a normal response. They can’t spit the way we would. Please let us know if you have any further questions. We’re here for you! Hi would this also kill Carpet Beetles ??? 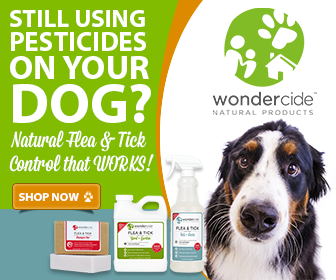 Our Wondercide products kill and repel 100s of pests including carpet beetles. Flea & Tick for Pets + Home, Indoor Pest Control and Personal Insect Repellent will kill carpet beetles from egg to adult by contact when you spray them directly. It will also repel carpet beetles when sprayed and left to dry for 2-3 days on average. Outdoor Pest Control and Flea & Tick for Yard + Garden are used to treat your outdoor areas for carpet beetles. They will kill all developmental stages of carpet beetles by contact. You do one full application and then a second full application within 7-10 days of the first. Routine maintenance can be done every 30-45 days afterward. ​Please let us know if you have any other questions. We’re here to help! Hi, I have a small seizure prone pup. Is this product generally safe for use on her? Thanks so much for reaching out, and exploring natural options for your dogs— you’re doing so much good for them! Our Flea & Tick for Pets + Home is safe for people and pets at all levels of health, including pets that are seizure prone. Our sprays are made with the highest quality, food-grade ingredients and are extremely effective at killing and repelling ticks. Consulting your holistic veterinarian can provide additional reassurance, but we’re confident that the Pets+Home spray can keep your pups protected safely, and naturally. We do make a Rosemary version of our Pets+Home spray. The very high purity, human-grade rosemary oil used in our Flea & Tick for Pets+Home spray is not associated with causing seizures, but we understand if you’d rather avoid it and have 3 alternate scent options (Lemongrass, Peppermint, and Cedar) that are mixed separately and do not contain rosemary oil. Please let us know if there is anything further we can help with. We’re here for you! I recently discovered carpet beetle shell casings throughout my house (have yet to find an actual larvae) and a few adults (~5 over a few days). I am a knitter and I have a lot of wool sweaters/scarves/yarn etc. that I am concerned about. I have heated my yarn up in my dryer and sealed some of my stuff in plastic bags, but I just don’t have enough to do all of my bedding and clothing. I am concerned that I could potentially get an infestation, and I don’t want to have to fumigate my house or use a fogger. I found your product online, and I just have a few questions before I make my purchase. I would appreciate it greatly if you could help me answer them. Can I use your indoor flea repellent on clothing? In particular, I have some old wool coats that can’t be machine washed. Would I need to dry clean them after applying this product? Or could I let them sit after they’ve dried. Would I need to wash my washable clothing after applying this spray? Or can I let them sit in my closet/dresser and be used as normal? I am also wondering if the instructions for indoors to “leave to dry 2-3 days” means the repellent only lasts for 2-3 days before I need to reapply, or if it takes 2-3 days to dry completely. I would appreciate clarification and your feedback on this. I apologize for all the questions, I just really want to make sure I’m making the best decision for my current (and future!) problems. Thank you in advance for your response. We’re so happy that you found us! Yes, Indoor Pest Control is able to be sprayed directly on clothing. If you’re spraying on a delicate fabric do a test spot before a full application. Lemongrass scent can occasionally cause mild discoloration of white surfaces or fabrics with extended daily use. The tint comes from the natural lemongrass essential oil, which has a slight yellow. Cleaning after the application is not necessary and would wash away the application making it ineffective at repelling. You would do a light even spray and leave it to dry. Indoor Pest Control kills beetles at every developmental stage when sprayed directly by contact. If you are through and spray the eggs, pupae etc you will kill the developing population and eliminate the infestation. When sprayed and left to dry it will temporarily repel pests from that area. The repellency will last for 2-3 days on average. Thank you again for reaching out, and please let us know if there is anything further we can do to support you! Is your product safe to use if our water is provided by a well and we would be spraying your product all over the lawn that will seep into our ground that is used by the well? Yes, our Flea & Tick for Yard + Garden and the Outdoor Pest Control is made with natural, human food-grade ingredients and are safe to use around your well. Please let us know if there is anything further we can assist you with. Have great day! Does your product have any effect on birds in the yard or any bad effects if they eat the bugs that are sprayed? Thank you for your interest in our outdoor pest control sprays. They are made from 100% naturally derived, human food-grade ingredients and are safe for birds or other animals if they eat insects that have been sprayed. Please let us know if you have any additional questions. Thanks for your message!